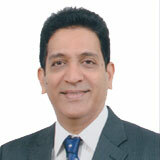 Mr. Ranganathan Sankaran is a qualified Chartered Accountant and Cost & Works Accountant. Ranganathan has around 21 years of work experience and joins Automotive Axles Limited from Circor Flow Technologies India Pvt Ltd, Coimbatore, where he was designated as Country Controller and Director-Finance. Earlier to this he has worked with Brady Company India Pvt. Ltd. as General Manager-Finance, Makino India Private Ltd as General Manager – Finance and Director, Faurecia Automotive Seating India Ltd, and Motorola India Ltd.